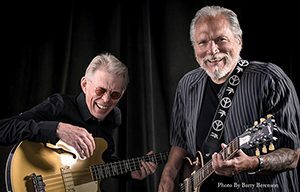 Hot Tuna owes its well-honed sound to legendary blues-rock artists Jorma Kaukonen (guitar) and Jack Casady (bass), and their decades of performing, mutual inspiration, and lifelong friendship. Fusing a variety of rock styles, free rhythmic techniques, and a collected timbre of instruments is what has identified this band over their 40+ years of playing. Inducted into the Rock and Roll Hall of Fame and honored with Lifetime Achievement Awards at the 2016 Grammys, Jorma Kaukonen and Jack Casady are institutions of the rock genre. Don’t miss this unique opportunity to hear them in this intimate space.